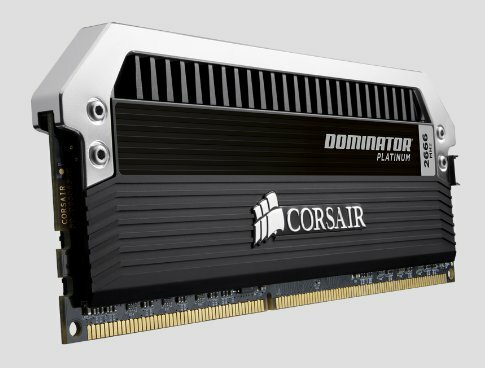 Corsair reveals the Dominator Platinum DDR3 lineup. Currently, the series achieves a clockspeed of up to 2800MHz, but at Computex the firm revealed a 3GHz edition is also in the works. You can view the specifications at Corsair. Corsair, a worldwide designer and supplier of high-performance components to the PC gaming hardware market, today announced the Dominator Platinum range of DDR3 memory kits, the world’s most technologically-advanced performance memory. The new design adds a customizable light bar to the list of exclusive features, which includes patented DHX cooling, Corsair Link support, and hand-screened, super-overclockable DRAM ICs. The new Dominator Platinum will be available in dual and quad-channel kits with 8GB, 16GB, 32GB, and 64GB capacities, and frequencies up to 2800MHz. Dominator Platinum DDR3 memory is designed to fully exploit the performance potential of the latest Intel and AMD platforms, including the "Ivy Bridge" 3rd generation Intel Core processor family. All Dominator Platinum kits support Intel's latest XMP 1.3 profiles for easy performance tuning. The new light bar contains a user-swappable light pipe which lets enthusiasts tailor the downwash lighting color to match their PC lighting and components. Dominator Platinum kits are supplied with a white light pipe, and additional light pipes will be available to purchase in the future. Dominator Platinum memory also supports full Corsair Link connectivity, allowing customers with Corsair Link to monitor DRAM temperature and other parametric data. This feature, unique to Dominator memory, provides end users with the data they need to tune system cooling and monitoring. Dominator Platinum memory kits also support Corsair AirFlow fans and AirFlow Pro dynamic temperature and activity displays to provide the low temperatures required for stable and reliable overclocks. Corsair Dominator Platinum DDR3 memory is available now from Corsair's worldwide network of authorized distributors and resellers. They are supplied with a limited lifetime warranty and are backed up by Corsair's highly regarded customer service and technical support.